An inventory performed in connection with the LEIT (Leadership in Enabling and Industrial Technologies within Horizon2020) Modelling Policy meeting in Brussels in February 2014, arranged by the ‘Advanced materials and nanotechnologies’ unit (D-3) within the European Commission, showed that reliability and validation of modelling results are among the top requirements that need to be met according to manufacturers and end users. 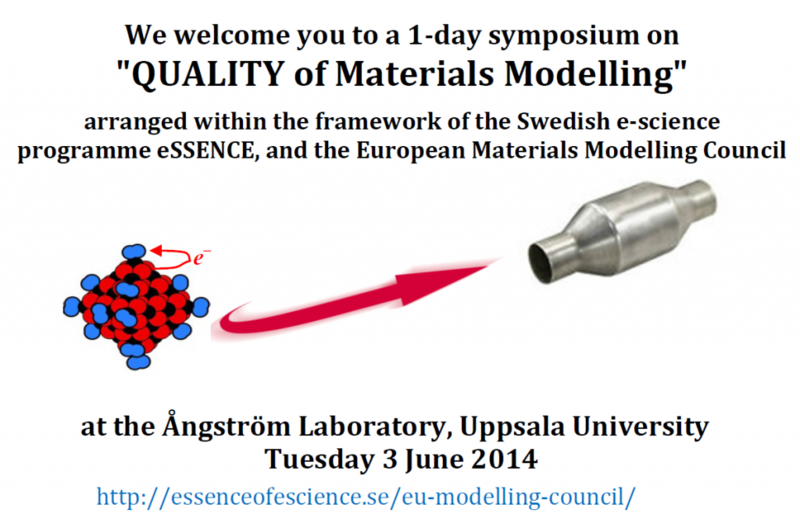 On June 3, 2014 we will arrange a 1-day symposium at the Ångström Labortory of Uppsala University, with the theme “QUALITY of Materials Modelling”. Method and model developments at all levels along the multi-scale simulation ladder are needed i order to push the boundaries of materials modelling closer to realistic applications. This symposium will focus on electronic, atomistic and coarse-grained modelling. Program: The day will contain invited and contributed talks, and a panel discussion. In addition to discussions of research results, we would like speakers to also address their own views on some of the following aspects of modelling – especially concerning electronic, atomistic or coarse-grained modelling. Do society and industry need results from modelling? What are the real bottlenecks of modelling today? What developments are needed to overcome these barriers? Scientific contributions, registration and finances: The meeting is free of charge, including lunch and dinner and coffee etc for all registered participants. If you want to participate, just send a mail to kersti@kemi.uu.se. If you want to sign up for an oral contribution, inform kersti@kemi.uu.se. If you need a financial contribution towards the hotel fee in order to participate, inform kersti@kemi.uu.se. Registration deadline: Friday 16 May 2014. Hotel rooms in different price ranges have been booked for the meeting, see Hotel information. Just send a mail to kersti@kemi.uu.se and we will fix it for you. Other practicalities: Uppsala is conveniently located 30 minutes by bus or taxi from Sweden’s main airport Arlanda, which is located just between Uppsala and Stockholm. See Additional information concerning maps, internet, and the meeting program which will be updated regularly. Meeting time: The symposium starts at 10 o’clock and ends with dinner in the evening. This 1-day symposium is part of a Multiscale Materials Modelling meeting which starts at 1 p.m. the day before (Monday 2 June) and ending at noon-time the day after (Wednesday 4 June). See http://essenceofescience.se/materials-2014/. You are very welcome to participate in the Multiscale symposium as well – just let us know (send an e-mail to kersti@kemi.uu.se). Please join our meeting and contribute with discussions and presentations!